Thank you Mik! World Heritage stamps promoting the Olympics of 2004. On the right is the Terrace of the Lions on the island of Delos. Constructed c.600 BCE, they were in dedication of Apollo, whose birthplace is said to be Delos. 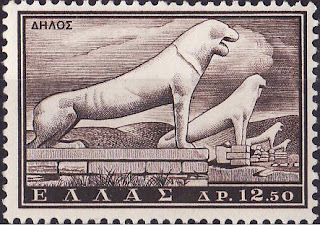 These lions are only one aspect in the large sacred landscape of Delos in ancient Greece. 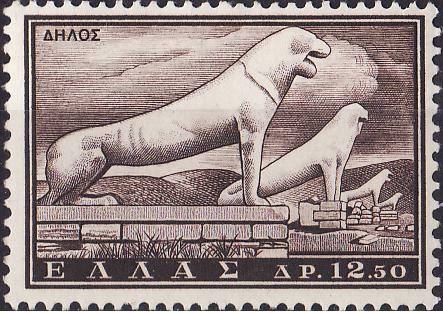 The lions from a 1961 tourism issue. The marble lions are now replicas, replacing the originals in 1999. Archaeological excavations began on Delos in 1873 by the French School at Athens. Top stamp is part of the 1970 'Mosaic' 6v stamps. It is an atrium floor mosaic in the House of Dolphins, where Erotes is shown riding dolphins. This was commissioned by the Phoenician home owner. From the same mosaic series as above.